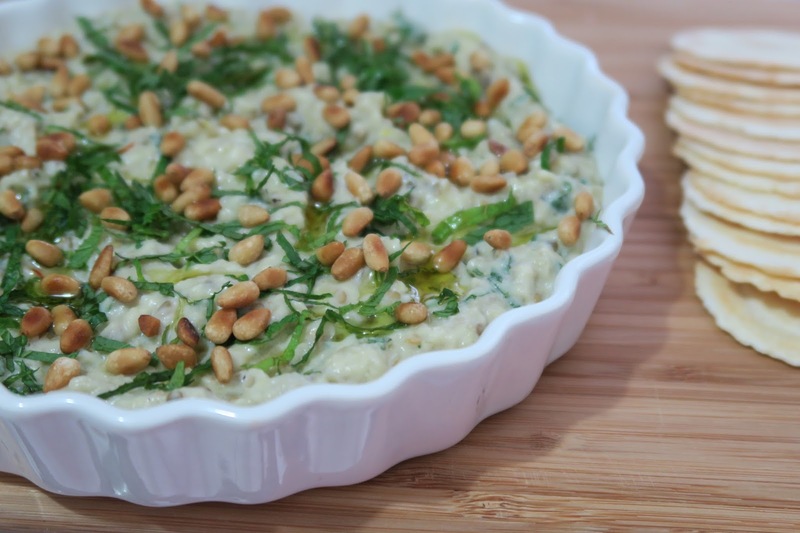 eggplant, mint & yoghurt dip from Feast by Nigella Lawson. Over the long weekend I had grand cooking plans. I was going to make donut holes from Emiko Davies new book Florentine and also banana bread from The Violets Bakery Cookbook but those plans fell through when I pull out my full container of flour and I had friends show up. Unwanted friends. Weevils. They gave me the heebie-geebies. I didn't inspect the moving critters for long. I ran the plastic container to the garbage bin as fast as I could and closed my cookbooks with a heavy sign and a shiver. Isn't baking what your meant to do on a long weekend? Fill your tummies full of delicious baked goods?? Scared with what else might be lurking in the other flours I decided that with the creepy-crawly feeling on my skin, I'd leave the baking for next weekend and make dip instead. We were going to a welcome home drinks so nibbles were appropriate, although I am sure they would have welcomed donut holes just as much. I decided to make the eggplant, mint and yoghurt dip from Nigella Lawson's Feast, I've made this a few times now over the years and it's always a winner. Feast was also one of the first cookbooks I ever bought myself and is full of splattered pages and bookmarked recipes, as a good cookbook should be. The dip is comforting yet fresh and best served with some crostini or toasted pita bread but I didn't have either so served it with crackers (which Tristan ended up leaving on the kitchen counter) and carrot sticks to counteract the chocolates we've all eaten. Can't say my craving to bake has been satisfied or my craving to eat home-made sweet treats but my jeans are certainly happier not having to fit in a donut or two after everything else I consumed over the weekend. Fingers crossed my baking ideas this weekend go to plan. - Preheat your oven to 220C/400F and prick the eggplants with a fork all over. - Place on a tray and roast for about 45 minutes to an hour, or until the insides have a soft squishy texture and the skin slightly darkened. Let them cool enough to handle, the scoop the insides out into a sieve to drain. - While the eggplant flesh is draining, heat 2 tablespoons olive oil over low heat and fry the onion and garlic until soft and almost golden, about 10 minutes. Add the eggplant flesh to the onions and cook for about 4 minutes, breaking up any bits that need it. Take off the heat and season with salt and pepper and allow to cool completely. - Soak the saffron threads into 2 tablespoons of just boiled water and let sit so the water turns a vibrant yellow orange colour. - Once the eggplant is cooled, mix in the greek yoghurt, saffron water, one tablespoon chopped fresh mint and another good pinch of salt and pepper. 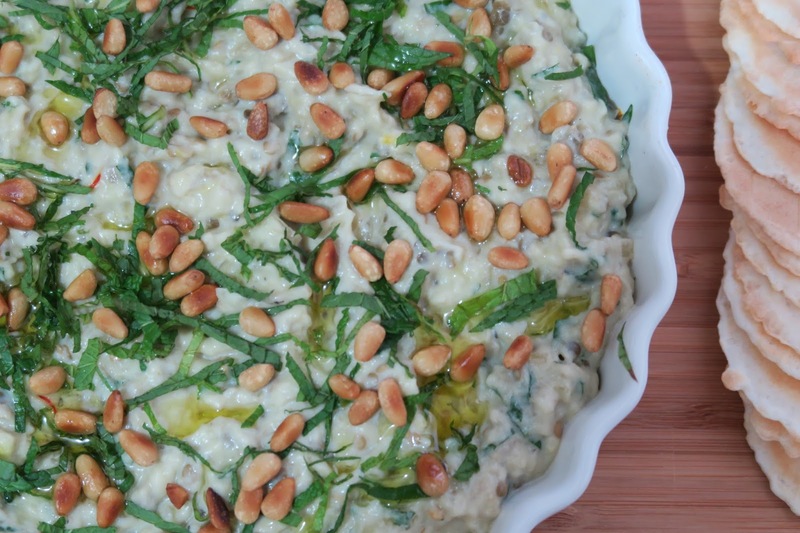 - To serve, sprinkle over the remaining fresh mint, pine nuts and a drizzle of olive oil. (The) Best Chicken: Baked Chicken in Creamy Tomato Sauce from Dinner: A Love Story. Have you ever been so unorganised you've woken up and realised you have only one pair of clean undies in your drawer and the day was a near total disaster?? I've had that phew! feeling more than once over the past few weeks. I've been some what unorganised which has also lead to a lot of dodgy dinners like last Saturday night which consisted of cheese and crackers or the other week when I reheated pasta sauce from the freezer on toast at 9pm. But everything changed last Monday night. I cooked dinner. It made me realise that cooking is my zen. What yoga is to some, cooking is for me. Not the mad rush kind of cooking in a commercial kitchen, been there, done that and I didn't have thick enough skin. But cooking in my little kitchen and making a meal out of ingredients gives me a certain satisfaction and feeling of fulfillment. Cooking for one doesn't have quite the same feeling as when I'm cooking for two or more so maybe it's not the act of cooking itself but the act of sharing what I've made with the ones I love. Or maybe that makes no sense at all and I was just so high on a home cooked meal I needed to share this with you all. I made (The) Best Chicken: Baked Chicken in Creamy Tomato Sauce from Dinner: A Love Story by Jenny Rosenstrach. It was so delicious. There was one problem, I only made enough for two and not enough for seconds or leftovers. It was a comforting, home cooked dinner at it's finest. It was simple yet so full of flavour. 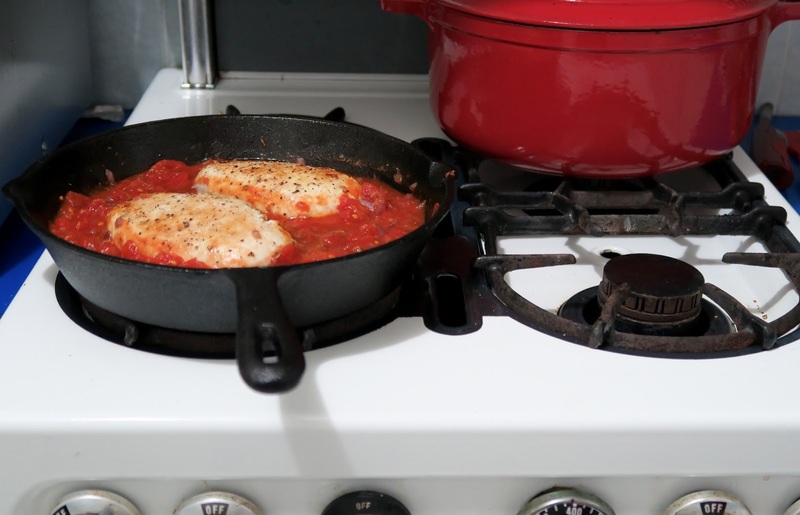 The canned tomatoes turn delicious and rich in the oven, almost sticky and as the chicken cooks it soaks up the flavour from the sauce and hint of herbs. I adapted the recipe slightly since we didn't have any marscapone as it's not a staple at our kitchen, instead I stirred through a couple of spoonfuls of greek yogurt at the end and it worked just as well. I served it with brown rice cooked with a stock cube and blanched sugar snap peas coated in butter and a good pinch of salt. It was rich and comforting and a dinner I will repeat again, especially since it's started getting a little cooler here. Store cupboard ingredients, chicken from the freezer and dinner is practically already made, a perfect weeknight meal. This would also work really well served with pasta or to make it a little fancy, serve it with a saffron risotto and a side salad. I'm now off to do some washing so that it's at least another week before I have that phew! moment again. - Preheat oven to 175C/350F. - Sprinkle the chicken with salt and pepper. 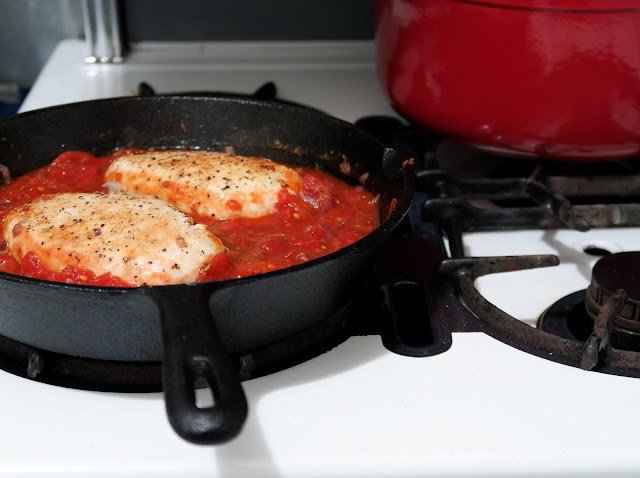 Heat the olive oil in an oven proof pan or skillet on high heat and brown the chicken on all sides (they do not need to cook through). Remove from the pan and turn heat down to medium-low. In the remaining oil left in the pan cook the onion and garlic for about 2 minutes. - Add the can of chopped tomatoes and bring to a simmer, stir through basil (or oregano) and season with salt and pepper. If using marscapone, stir through now. Add the chicken back into the pan then place in the preheated oven. - Bake for 40 minutes, turning half way through or until the chicken is cooked through. - If you are using greek yogurt, remove the chicken from the pan and stir through the greek yoghurt now. Serve with rice, pasta or some nice crusty bread and some buttered greens. Lemon Maple Granola from A Modern Way to Eat by Anna Jones. It was one of those morning yesterday where I didn't want to get out of bed. I could have quite happily stayed under the covers all day with a pile of cookbooks to keep me company and thats it. The only plus side was that I had homemade granola waiting for me, all I needed to add was thick greek yoghurt and fresh strawberries. It was amazing. A few weeks ago I made the Lemon Maple Granola from Anna Jones's cookbook 'A Modern way to Eat' and then made it again since then it was so good. My old pickle jar which works great in its second life as a granola jar will soon be empty, I don't even think I can last until Friday which is a scary thought. I might be making a batch of granola after night classes on Thursday... I will have definitely gone granola mad if that happens. I need my fix in the mornings!! I hated breakfast as a kid. How things have changed. My parents would drill it into me that I needed to eat a huge breakfast to get me through the day and they were right, I just never liked it. On week days, before school I would have to eat a bowl of fruit, a bowl of cereal and a piece of toast with a glass of orange juice to wash it all down. Weekend breakfasts weren't fun either, I hated eggs growing up so unless I got pancakes, breakfast was always a let down. I'd have rather eaten a bowl of spaghetti in the mornings instead. Since I've grown up I love weekend breakfast and all eggs whether they are runny, hard, soft, scrambled, boiled, poached or fried but I never have time to make eggs of any sorts on the weekdays as I am running out the door like a mad woman. So for a while weekday breakfasts were a chore, I used to scoff down some dry cereal and that was that. Until I discovered home-made granola. It's a revelation. I'm fussy when it comes to cereals, they are either overly sweet, have too much 'fake' vanilla flavour or are heavy on the cinnamon and always have random bits of fruit in them. Making my own means I don't spend 5 minutes fishing out the mysterious yellow squares of dried fruit in my bowl that are listed as 'tropical' fruit on the box. Anna Jones's Lemon Maple Granola is seriously delicious. The lemon gives is very subtle in the mix is a lovely freshness that gives you kick in the mornings and goes great with the sweet maple and earthiness of all the seeds and grains. It's quite a nubbly granola mix with all the seeds, baked dried fruit and nuts so goes great having some fresh fruit to serve with it and of course a healthy dollop or two of greek yogurt. It ticks all the boxes in the morning that a breakfast should do. I now wake up and look forward to my granola in the mornings, just wish I could take it make to bed with me along with a book rather than leaving the house. Thinking of making this one next which Amelia from Bon Appetempt makes with her son, Teddy. Am going on a dried cherry hunt this weekend, just need to hold out until then and refrain the crazy lady inside of me from making midnight granola. - Preheat oven to 180C or 400F and lightly grease two large baking trays with some butter or vegetable oil. 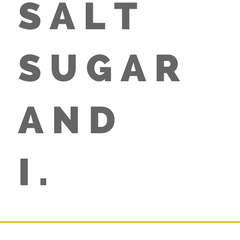 - In a large bowl add your oats, quinoa flakes, pumpkin seeds, sunflower seeds, almonds, coconut, lemon zest and roughly mix until everything is spread evenly throughout. Pour over the maple syrup and give it a really good mix so all the little flakes and seeds are coated, don't rush this bit. - Divide the mixture onto your two large trays and bake for a total of 30 minutes, but stir every 5-10 minutes to get an even colouring. You may need to bake it for a little longer or a little less, depending on how strong your oven is but in the last 10 minutes of baking try and throw in your dried currants and cranberries. This will turn them into sticky, almost caramelised, chewy nuggets throughout the granola. - Once it is a lovely golden colour, allow to cool completely in trays then transfer cooled mix into an airtight jar or container. The granola will last up to 4 weeks, although mine never seems to last that long as the jar seems to be forever empty. - Serve with some thick greek yoghurt and chopped fresh fruit. 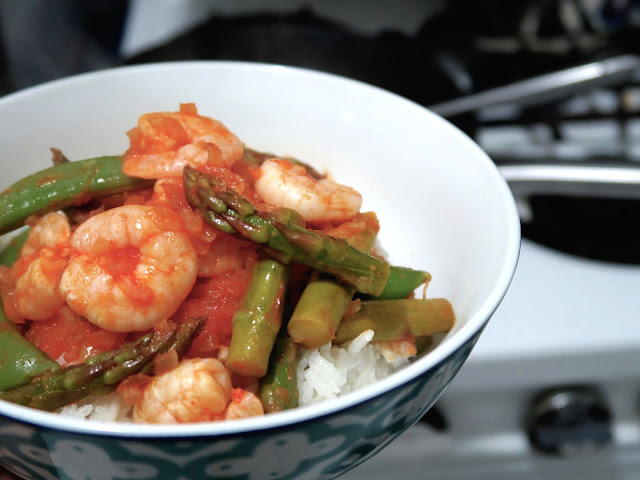 Sriracha Prawns over Coconut Rice from 'My Kitchen Year' by Ruth Reichl. I'm going to be brutally honest with you all. I wanted to make the 'Big New York Cheesecake' from Ruth Reichl's new book 'My Kitchen Year' which has a chocolate wafer base for dinner on Sunday. And since Tris left for sea that night I had no one to tell me what I could and couldn't have for dinner. But then this pesky thing call conscious kicked in, it's like the little devil on my shoulder but I did kind of agree that making a whole cheesecake for one isn't really the healthiest option so instead I went with the more dinner suitable recipe from her book. Sriracha Prawns over Coconut Rice. The main ingredient is obviously Sriracha chilli sauce. This isn't a staple in our home so I didn't have any on hand and after hunting the supermarket isles for this Sriracha chilli sauce like a mad woman and coming up empty in the international food section I almost gave up hope. There have been a few recipes where I have had grand plans but then can't find an ingredient and have easily been defeated. I thought I'd check the sauce isle to see if for some odd reason it was there and boom! One last bottle was sitting there all on its lonesome. It was mine for the taking. This recipe is sweet, sour and spicy all at the same time but is mellowed out by the coconut rice which almost acts like sour cream does to a spicy chilli. The prawns release their sweetness while the sauce is fragrant from the garlic and ginger but spicy and sour from the lime and Sriracha chilli sauce. As always, I can't cook rice for one and didn't follow that part of the recipe and I ended up with so much coconut rice I have it coming out of my ears (and freezer) now. 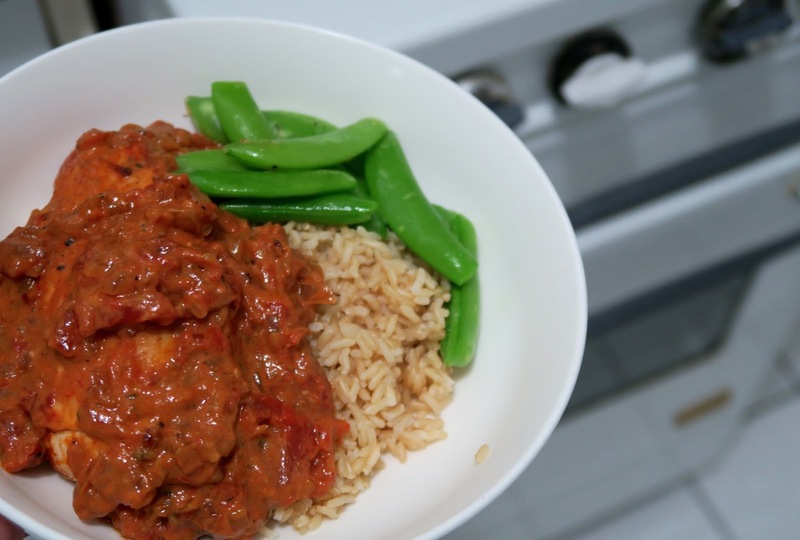 I've made this twice now, the second time I didn't have as many prawns as the recipe asked for so filled it out with some sugar snap pea which worked really well. Also ff your not a fan of seafood or have an allergy you could always substitute to for chicken breast. I think it's a great dinner to change up slightly for what you have in the cupboard/freezer at the time. Next on the list to make from this Ruth's book is the pork dumplings. I want to make batch and freeze them for later mid-week dinners to put in asian soups or noodle dishes or even just on their own with the dipping sauce. You never know, with them in the freezer, it might even suppress the Friday night takeaway urges? Now for those sweet-toothed readers who feel cheated and are still stuck on the cheesecake in the first sentence, you will find the recipe over on Bon Appetempt thanks to Amelia and for those Australians who have no clue what the 'Famous Chocolate Wafer' is, you'll find the recipe for them over on Smitten Kitchen, which Deb has created. - Start with the prawns. I used frozen thawed prawns for this recipe but if you can get raw prawns from the fish show, even better. Make sure they are peeled then place in a bowl with the lime juice and 3-4 tablespoons of Sriracha sauce and let marinade for abut 15 minutes. - While the prawns are marinating, get on with the coconut rice. Wash the rice until the water runs clear. Drain and then sauté in a knob of butter. When its glossy add the coconut milk and 3/4 cup water (you can vary the proportions here to have more or less coconut milk, I used a whole can which is 400g and added less water). Add a pinch of salt, on medium heat bring to a boil, cover, then turn the heat down to low and cook for 20 minutes. Remove from heat and let sit for a further 10 minutes. 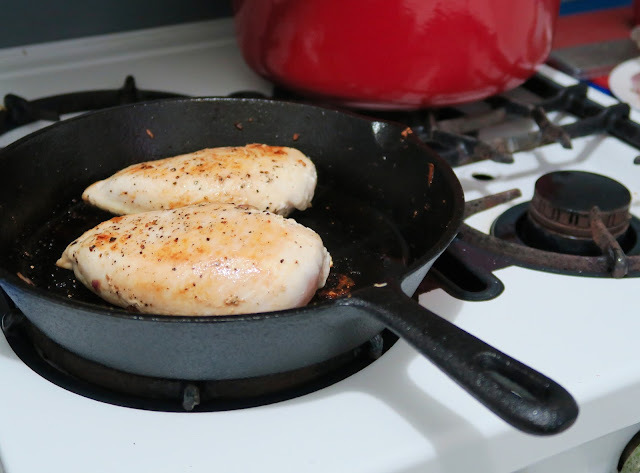 - Heat a frying pan over medium heat with about 2 tablespoons of vegetable oil in it. Once it is hot, add the onion, garlic and ginger and cook until the onions are translucent and it smells fragrant (about 5 minutes) add the asparagus and cook for a further couple of minutes. Lastly add the prawns and all their marinade, turn the heat up to high and cook until prawns are cooked through (about 3 minutes - depending on the size of them). - Serve prawns over the top of the coconut rice with extra Sriracha sauce if you need more of a kick. Confessions of a cookbook addict. Lets talk about books bae-bee, lets talk about coo-oo-king. 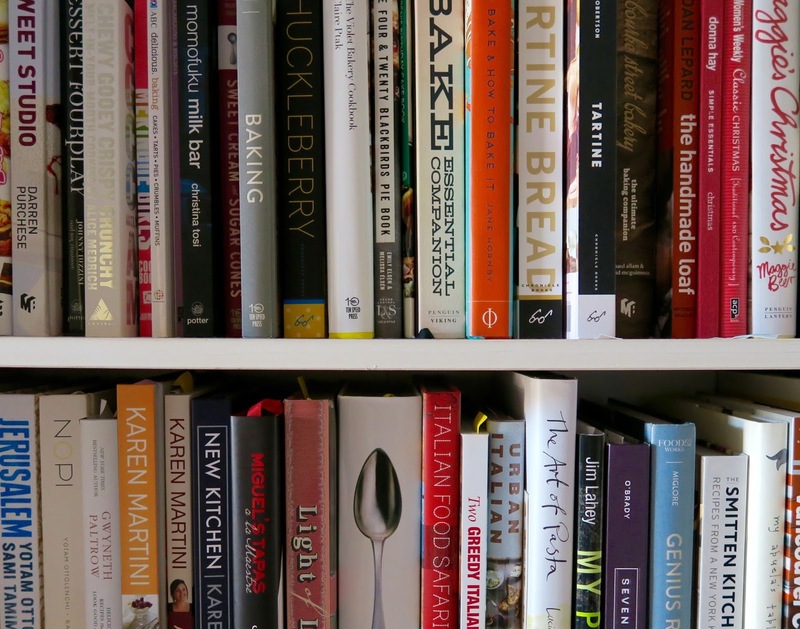 Lets talk about all the cookbooks that I own and more bae-bee, lets talk aboooout books! But seriously, lets talk about cookbooks. I think one of the big questions with people who love to cook and eat is 'how many is too many cookbooks?' have you ever googled this? I have. And I think that was my answer... if you have to ask, you already know. The 'library' tab above which links books I own to the recipes I've blogged about is a significant list but embarrassingly so, I've got more books than listed there and every week a new book pops up from another chef I love, a blogger who I'm addicted to or a cuisine I want to learn more about and I have a weekly obsession and HAVE to own the book NOW. I do my research on each book before I buy and read book review after book review like they are going out of fashion but once I've got an idea in my head the bad reviews are easily skimmed over and I only pay attention to the 5 star ones which makes the need and want to buy it even more strong. The way I'm trying to see it is that some people collect stamps or coins and I collect cookbooks. I don't think it's an item to collect that will eventually make my great-great-grandchildren rich like stamps and coins sometimes do and they are certainly not a small item to collect. But the excitement of receiving a new package in the mail, knowing that inside is a beautiful bound book full of recipes that will soon be cooked in my kitchen, shared with friends, be the next best birthday cake or just the Wednesday night dinner that turns into a weeknight staple is waiting in the pages to be cooked and eaten. It's exciting. I read cookbooks before bed and have a stack on the night stand most of the time, I grab one to read with my Sunday morning cuppa on those lazy weekends and if I find myself with a spare couple of minutes before I have to leave, my nose is buried deep in one. I'll be dreaming up ideas for the ideal dinner party I'll eventually have when I can fit more than two guests in my apartment, or the Friday night dinner I'll make instead of order pizza or that nights dinner and mentally working out what ingredients I already have and what I can substitute for what. And oh my goodness... the smell of a new book... gives me shivers. I've been known to walk into bookstores, do a few laps (of course stopping and flicking through the cooking section) just to get a fix and then walk out, Tris shakes his head at me every time. So I've come to a conclusion. My name is Dani and I'm a cookbook addict. The first step is admitting you have a problem right?... so if I do not post after today, please send help. I may have been unwillingly enlisted into cookbooks anonymous. Or squashed by an overloaded bookshelf collapsing on me. Do you also suffer from this addiction? 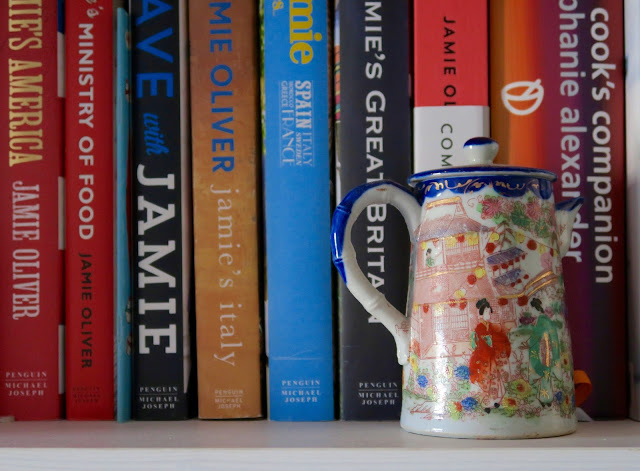 if so, how many cookbooks do you own?